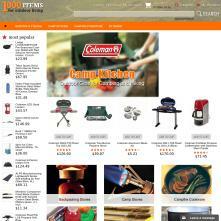 Full-width Magento Template is the latest trend Magento template building. It will help you to maximize your retail business. Show off your goods with this easy-to-customize and fully featured full-width Magento theme. Magento template is suitable for online shop with massive products and huge categories. Unlimited color optionThere are two color schemes to choose and you can also make a custom one. Top menu, Left menu, Right menu, Mobile menu. This useful plugin allows you to easily modify Magento menu layout. This extension calculates product image size depending on the screen resolution and special Magento settings. Create as many sliders as you want. It’s very quick and easy with our Total Slider Manager. Without touching any code, you can create multiple sliders that can be included anywhere using the Magento backend. Total Slider Magento extension is the most advanced and powerful slider manager available for the Magento eCommerce platform, making the creation of slides easy for Magento users at all skill levels. All of the included sliders have very simple interfaces, so there is no need to edit any code. 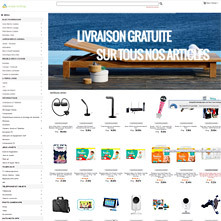 Link to 'My Cart' which displays a box with a summary of the shopping cart items on mouseover. MD QuickView Product is a frontend feature that speeds up the browsing process through store by showing product previews on click. 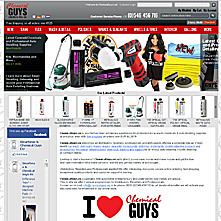 Extensions is a great feature that enhances user experience while browsing your store. This simple Magento extension allows you to add a tabbed interface to a product page. Blog for Magento. Shows posts with comments. Comments can be auto approved or moderated by admin. Categories. Plus much more. 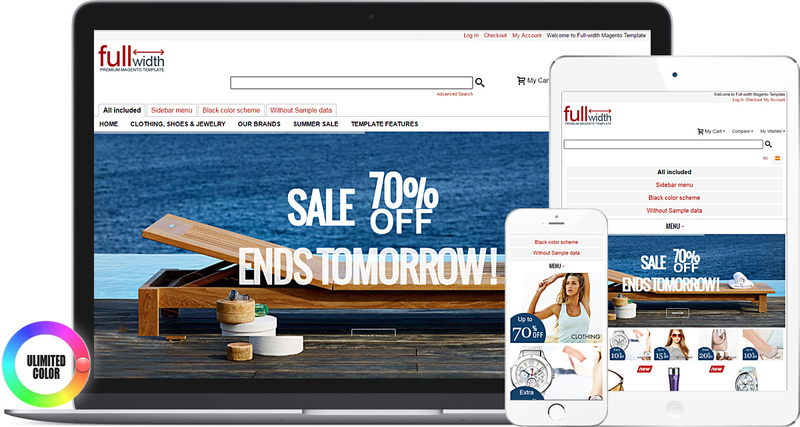 All best stores based on our professional Magento templates and premium extensions: Magento Stores Showcase. 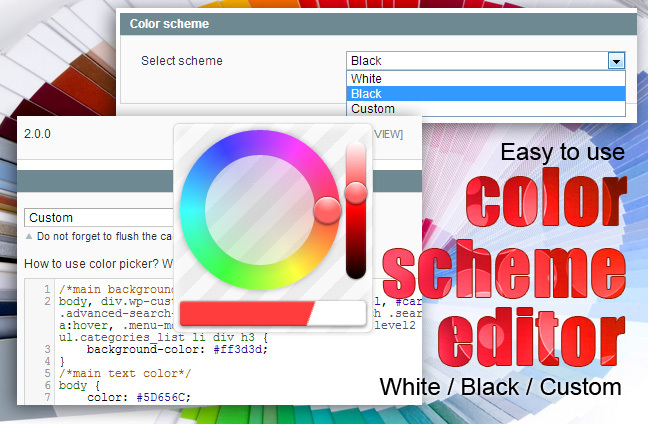 There are two color schemes to choose for this theme (black / white). You can also make a custom one. You can customize the color accents of the Magento theme as needed. This will save you time and will automatically do things that would otherwise require a search for the code in the CSS files. There are 7 layouts for display highlighted categories including banners, subcategories, full-width sliders and various combinations of banner/slider and highlighted products. There are 3 layouts for displaying products. You can manage image size and number of products per line in the Magento admin panel. These options can be applied to the home page and any catalog page. It is possible to choose which product field to display: product name, product reviews and ratings, product short description, addto links, add to cart button. Fully customizable Magento catalog; most popular block, testimonial block, home page products, payments, company info footer block, social bookmarks block, and SEO text block. One of the most important steps in testing template is filling it with a sample data and defining how the template looks and runs with the content. 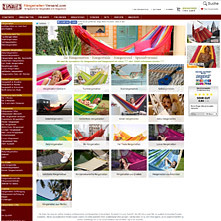 The sample data contains the website settings, sample products, Magento extensions, menus, and images. This service is useful when you want to clone the functionality of the template demo store and examples of page design and layout. Sample data is very useful as it helps you check the theme for formatting, widgets, comments, etc. And it will help you to learn how to use the store by exploring the demo products configuration settings or test different themes or extensions. 2015-07-14 - Current Release 2.4.0 stable. Added Smart Menu extension. Total Slider Manager included for free. 2015-02-05 - Current Release 2.2.0 stable. Sample data Magento version 1.9.1.0. Updated extensions to validate html5. Valid CSS3. Added vector icons. They are scalable and correctly render on retina screens or mobile displays. 2013-08-02 - Version 1.2.0. Fixed bug with the Most Popular block in the search page. 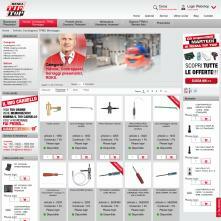 Smart Catalog Magento extension were updated to the latest version. These files were changed: /app / design / frontend / default / wp_full_width / template / webandpeople / smartcatalog / , css styles (skin.css, style.css) were changed for product list classes. 2013-02-06 - Version 1.1.5. Added following features to the Magento template: improved Smart Columns feature (renamed to Smart Catalog Magento extension), added Magento extension Back to Top Button, fixed css code for adding custom (specific) fonts. 2012-12-30 - Version 1.1.1. Added following features to the Magento template: responsive search-button, some css-fixes and design changes. 2012-11-15 - Version 1.1.0. Added following features to the Magento template: an Ajax search bar, Catalog options toolbar, catalog icons. It allows many changes without appealing to a developer help. The quality of the structure, details and the real possibility of customizing the work are fine. Very nice template but no updates since Juli 2015 so it is not compatible with the latest magento versions. Support is also very slow to respond up to a month (if you are lucky). Excellent customer support, solved my issue in less than one hour. I use this theme. I have another theme installed on my store but i uninstall and install this one. Problem solved very quickly, thanks! ..Highly recommended!!! I had no problems so far with their template design and their support. Thank you for your template. It fit perfect to my Site.